Hundreds of pounds of plums are rotting on Seattle’s sidewalks this time of year, especially in the southend (where Italian truck farmers once settled), so now’s the time to find ways of consuming and preserving this free food source. 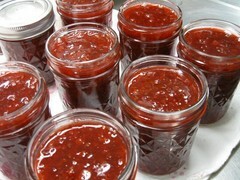 Canning and jam making is one way. Terrie Irish, a WSU-trained master food preserver, taught the basics of canning and jam making at the Beacon Hill Community Center kitchen last night. Twelve southenders spent three hours cutting, cooking, packing and canning the sweet Italian prune plums provided by CityFruit. And there will be another canning and jam making class in south Seattle on Sept 29 (email moc.liamg|gnik.c.etak#moc.liamg|gnik.c.etak to get on the wait list). 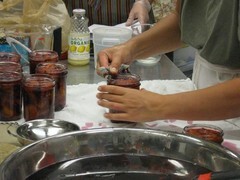 These classes are brought to you by CityFruit, Sustainable South Seattle and Terri Irish at www.SummerInAJar.com.